Regular maintenance of patio furniture will help keep it looking and functioning like new. Many repair parts and instructions on how to install them yourself can be found online. If you happen to live in Southern Arizona, the company has a physical location in Tucson. A convenient map is provided for locals. Samsonite Patio Furniture carries repair parts for the original line of Samsonite steel framed furniture. Samsonite also sells a line of aluminum outdoor furniture called Halcyon. These parts are not suitable for the aluminum furniture and will only fit the steel line pieces. Also offered on this website are replacement slings and cushions for the steel framed furniture. You also have the option of shipping your furniture for repair or arranging for pickup and delivery at the Indiana location. You can call or e-mail the company if you have questions. Patios To Go offers a line of outdoor PVC furniture replacement parts. They carry 40 furniture grade PVC fittings and pipes for repairing outdoor PVC furniture. If you live in western Pennsylvania or eastern Ohio, A+ Redemption Inc. is the go to place for outdoor furniture repair parts. This company also offers complete restoration, repair or refurbishing of all types of outdoor furniture for both residential and commercial applications. For do-it-yourselfers, the company has a separate site called Patio Furniture Rehab, where you can find parts and support from an online community of people who have repaired their own patio furniture. if you need to make a quick repair before a planned event such as a pool party or backyard barbecue, be sure to check your local yellow pages or look online for a local outdoor furniture retailer in your area. You can also try your local home improvement or hardware stores to see what parts they may have in stock. 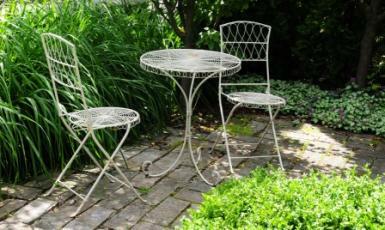 Keeping your outdoor furniture in top condition is easy when you know where to find patio furniture repair parts. Investing in outdoor furniture covers may also help cut down on repair costs in the future.